On 28 July 1999 María Inés Mato was the sensation. 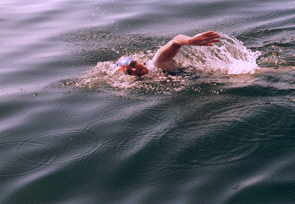 In a record time of 11 hours 04, minutes she beat the 60 years existing Beltrecord on the distance between Rødby (Denmark) and Fehmarn (Germany) by 53 minutes. She left the Danish coast early at 7.30 am. Despite the otherwise perfect climatic conditions, she had to fight the whole time against the strong current in the Fehmarnbelt. Accompanied of several television teams, radio and newspaper reporters she arrived beaming with joy at the Grüner Brink beach, close Puttgarden, on Fehmarn. Already more than 1000 spectators, who all daylong pursued strained the fight of Inés against the nature forces at the beach and in the water were there waiting. She was received at the beach with a large and enthausiastic applause.. The Beltquerung was supported under the patronage of the tourism Minister of Schleswig-Holstein, Klaus Buss, the German Sport University of Cologne, the Argentine Embassy and the DLRG (German Rescue). 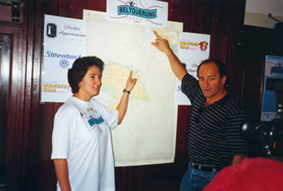 Back in 1998, the International Year of the Ocean of the UNESCO, Inés had already attempted to cross the Fehmarnbelt and despite her good physical conditions she had to abort the attempt. With wave heights of 2 meters and lateral drift with wind force 6 it was impossible for her leadingboat to hold the direction.